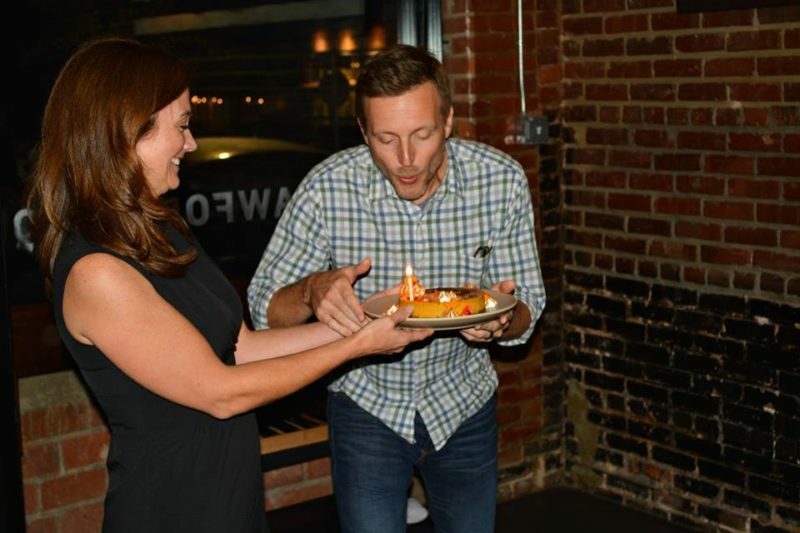 Our Son Michael recently celebrated his 40th birthday at Crawford and Son restaurant in Raleigh. It was a food and beer pairing executed by Chef Scott Crawford and Full Steam Brewery Executive Sean Wilson. Our wonderful Daughter-In-Law Kristen organized everything and it was a magical evening with 40 of Michael and Kristen’s friends and family. 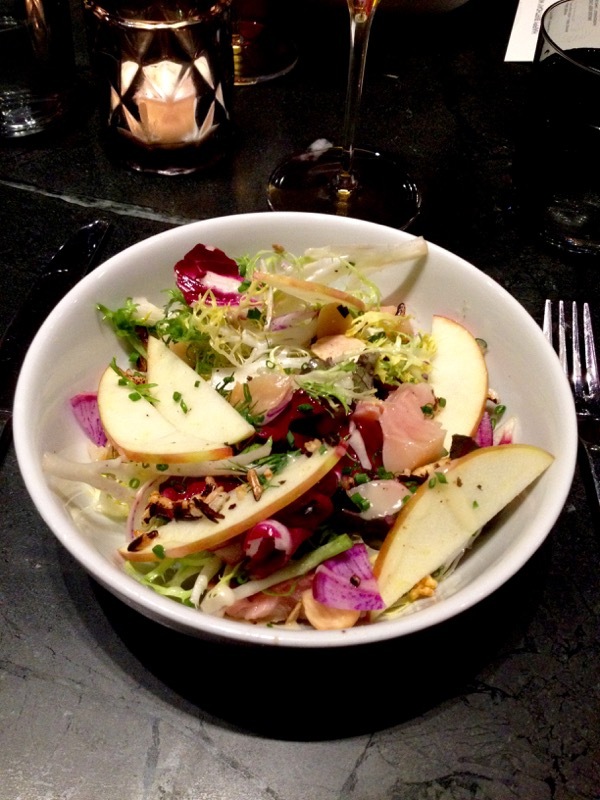 The first course was a Frisee Salad with Smoked Trout, Honey Crisp Apple and Ramp Vinaigrette. It was paired with Full Steam’s Deep Chatham Wild Paw Paw Ale. The woodsy ale complimented the wild ramp and smoked trout salad. 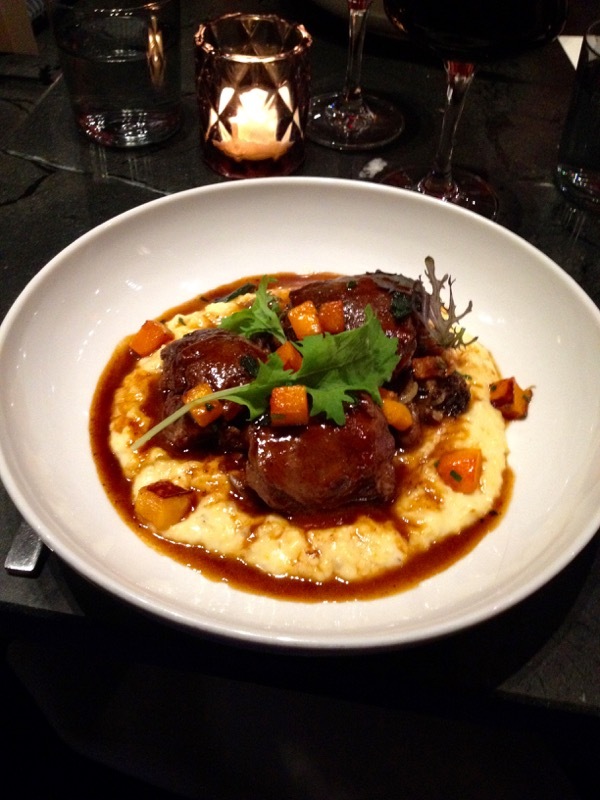 The main course was Braised Beef Cheeks with a Mushroom Ragout and Campo Cheese Grits. It was paired with Fullsteam Igor Imperial Stout. The beer was deep and rich. 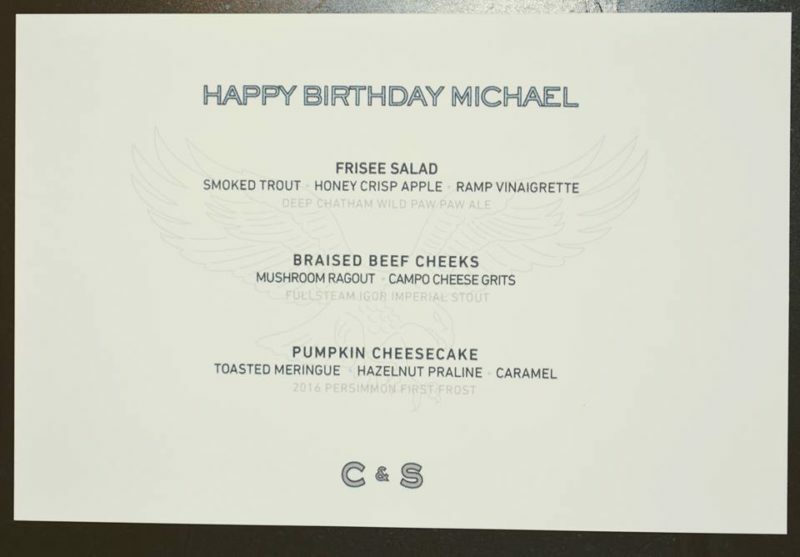 I loved the beef cheeks. They were fork tender and cushioned by the very best cheese grits that I have ever tried. Campo cheese is a semi-hard Spanish cheese that is a combination of cows’ milk, goats’ milk, and sheep’s milk. It is very similar to Manchego cheese. I will be experimenting with this recipe. 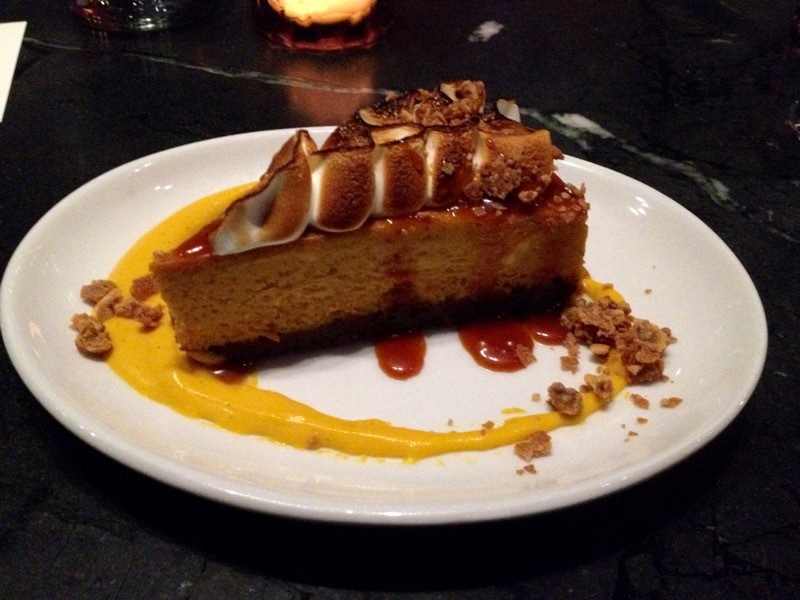 The dessert was a Pumpkin Cheesecake with Toasted Meringue, Hazelnut Praline and Caramel. It was paired with a 2016 Persimmon First Frost. The beer is fruit forward with hints of holiday spices, so it went very well with this pumpkin cheesecake. Scott Crawford is an amazing chef. Each course was executed flawlessly. 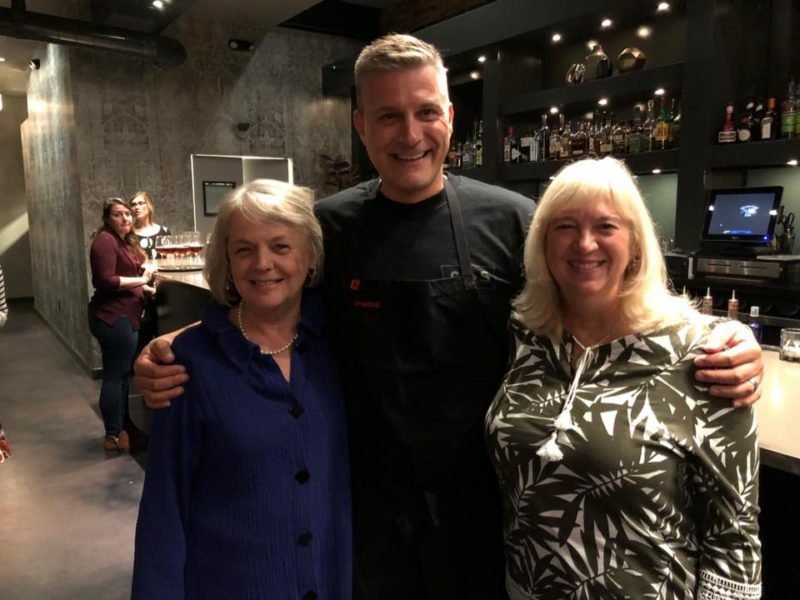 We have a long history with Chef Scott Crawford. 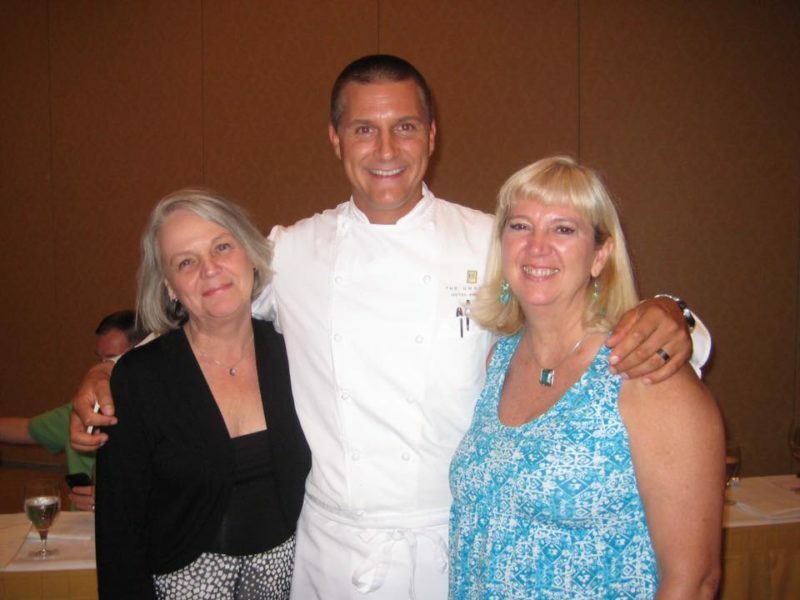 At one time he was the Executive Chef at Heron’s Restaurant in Cary. 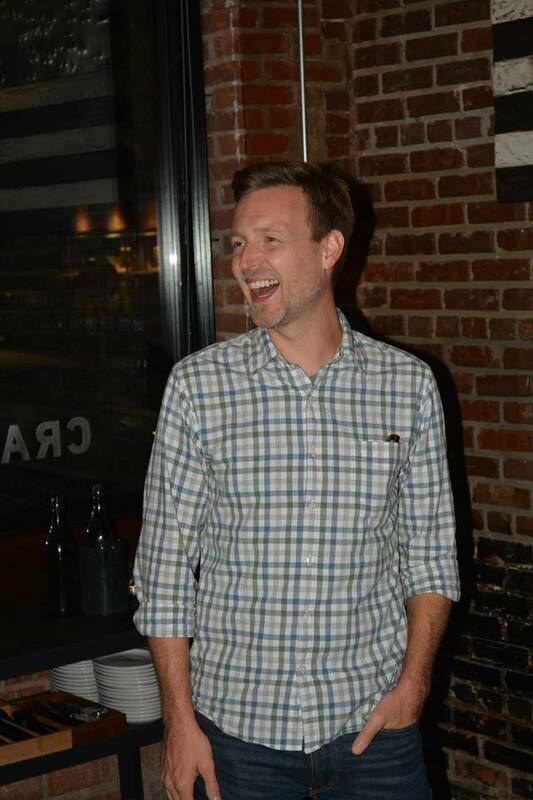 Since opening his own restaurant in Raleigh, Crawford and Son has gained a loyal following. Kristen’s Mom, Darla and I have had our picture taken with him before. This was taken 7 years ago at Heron’s. As a beer enthusiast and home brewer, Michael was in his element at the restaurant. Happy Birthday Sweet Son. We enjoyed your celebration so much. Some pictures courtesy of Darla A. and David W.
Posted on November 9, 2017 at 11:49 am. When in doubt about what to have for supper, I tend to favor making a quiche. After all, the ingredients are always in my fridge. As luck would have it, I also had a perfectly formed pie crust in its pan in my freezer from a previous cook-a-thon. The inspiration for using zucchini came from a post by David Lebovitz. Here is the picture from his blog that inspired me. 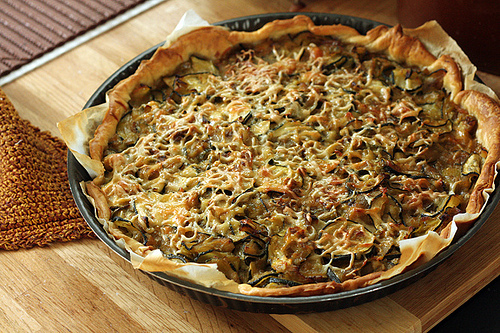 The tart was made by a friend that he was visiting in the French countryside. Quiches and tarts seem very French to me. I guess that is one of the reasons I am drawn to them. It may also have something to do with the buttery richness of the pastry. There is something to be said for the creative ways that the French use seasonal vegetables. The other ingredients in this particular quiche were bacon, Gruyere cheese and a pinch of nutmeg. Because my pie pan, which I picked up at an antique store, was very shallow I needed only 2 eggs and 1 cup of cream. The quiche was one of the best I’ve ever made. The pastry is a “no fail” recipe from Ina Garten. I strongly suggest that you get out your food processor and make a batch of pastry dough. Either freeze it in individual discs or do like I did and have it ready to go in your pie plates. You won’t be sorry. Preheat oven to 350 degrees F. Cook bacon in a 12-inch skillet over moderately high heat, stirring occasionally, until just crisp. Transfer bacon with a slotted spoon to a paper-towel-lined plate, reserving the fat in the skillet. Add the zucchini and 1/4 teaspoon salt and saute over moderately high heat, stirring frequently, until zucchini is tender and starting to brown, about 5 minutes, then transfer with slotted spoon to a plate. In a large bowl, whisk together the beaten eggs, cream, milk, pepper and remaining 1/4 teaspoon salt. Stir in the bacon, zucchini, and cheese and pour into prepared piecrust. Bake until filling is just set, 25 to 30 minutes. Transfer quiche in pan to rack to cool slightly and serve. Dice the butter and return it to the refrigerator while you prepare the flour mixture. Place the flour, salt,and sugar in the bowl of a food processor fitted with a steel blade and pulse a few times to mix. Add the butter and shortening. Pulse 8 to 12 times, until the butter is the size of peas. With the machine running, pour the ice water down the feed tube and pulse the machine until the dough begins to form a ball. Dump out on a floured board and roll into a ball. Divide the dough in half and flatten each ball into a disc. Wrap in plastic wrap and refrigerate for 30 minutes. At this point you could freeze one or both of the discs. If using immediately, generously flour a board and roll one of the discs into a circle, rolling from the center to the edge, turning and flouring the dough to make sure it doesn’t stick to the board. Fold the dough in half, place in a pie pan, and unfold to fit the pan. Crimp edges. Repeat with second dough round. Can be frozen, well wrapped, at this point. 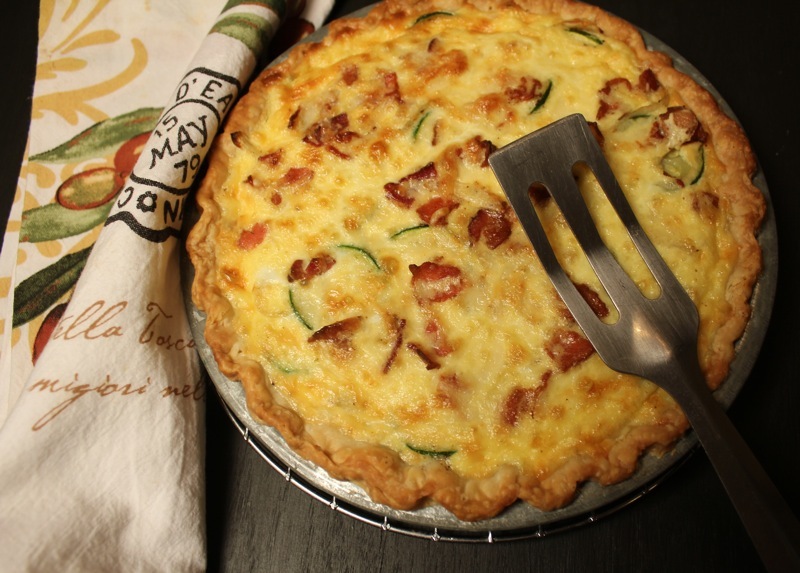 If using for quiche immediately, return dough in its pan to refrigerator for 30 minutes. Remove from fridge and line with parchment paper. Dump enough dried beans into parchment paper lining to fill the pan 3/4 full. Bake at 450 degrees for 15 minutes. Carefully remove parchment paper and beans from pie plate and continue to bake for 5 more minutes until pastry is just starting to brown. Remove from oven. 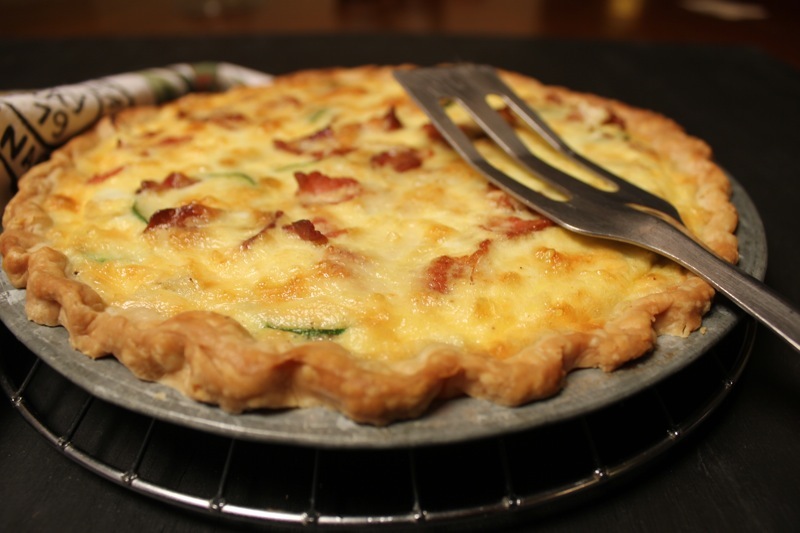 Proceed with quiche recipe. Posted on September 5, 2013 at 8:04 am. 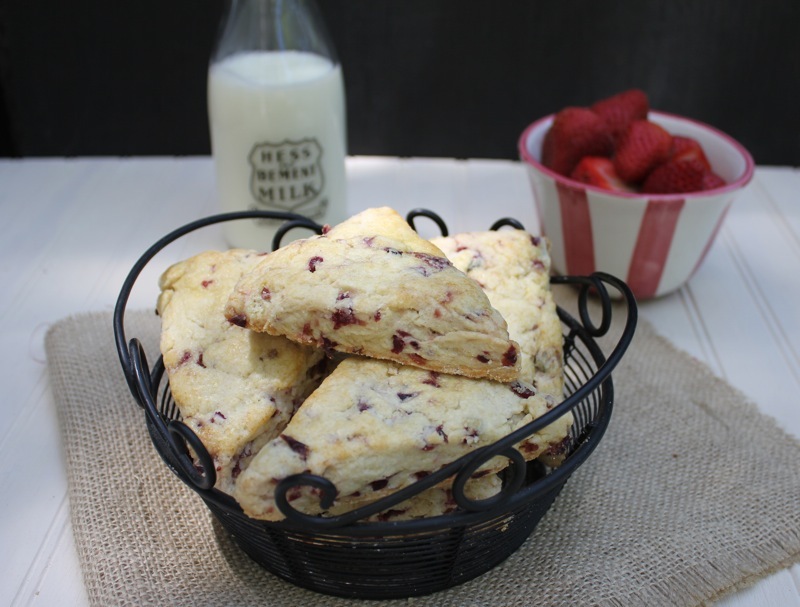 There is nothing better than a basket of warm homemade scones for Mother’s Day. That is exactly what I treated myself to today. I am spending Mother’s Day on my own because David is on a motorcycle trip to Texas and the kids are away doing other things. Sometimes it is OK to be alone on a holiday. As far as I’m concerned, Mother’s Day is every day of the year. I get all of the love I need from my family on a regular basis all year. So I chose to celebrate this day as a day of rest, indulgence (the scones) and remembrance of my Mother. My Mother was everything that I always hope to be; Good, talented, funny, forgiving and kind. Her influence on her devoted children, grandchildren and great-grandchildren was stupendous. She was a talented artist and a naturally good cook. Two of her granddaughters inherited her cooking and artistic genes. At least one of her great-granddaughters (My Rachel) is a talented artist. The art part passed me by, but you can’t say I don’t love to cook. 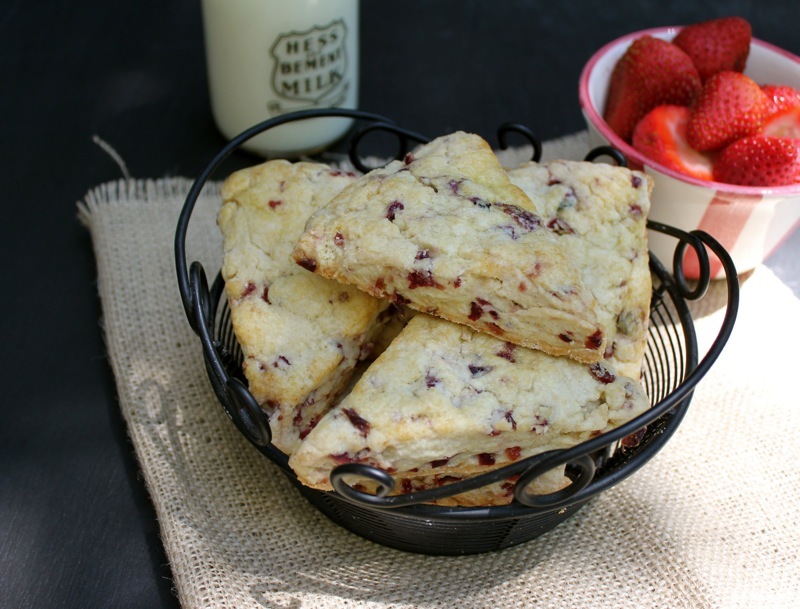 When we were in Nantucket, Mary Anne made the most delicious Currant Scones one morning for breakfast. She said they were from a Martha Stewart recipe in her Baking Essentials book. I never did find that specific recipe, but this one came from the Martha Stewart Cookbook. There were no dried currants in my supermarket so I substituted dried cranberries and plumped them with orange juice. The recipe was easy. Why haven’t I made scones before? What I love about Mary Anne’s scones is that they are mealy and flaky like pie crust. There are no eggs in them and that may be the difference from other scones that I have tried. I love that flaky consistency. I lounged in bed this morning with my coffee and scones, read my mystery du jour, encouraged the dog to wait until 10:00 AM for her walk and just chilled. What could be better? Tonight I am having my favorite grilled hamburger and a salad. Easy and delicious. Simple pleasures for a solitary, contemplative and peaceful weekend. Sift the dry ingredients into a large mixing bowl. Using a pastry lender or two kitchen knives, cut in the butter until the mixture resembles coarse meal. (This can also be done in a food processor, using half the flour mixture, and adding the processed mixture to the remaining flour before adding the currants and cream.) Stir in the drained currants. Mixing lightly with your fingers, add just enough heavy cream to hold the mixture togeher. Wrap in plastic wrap and chill approximately 30 minutes or overnight. Roll out the dough 1/2-inch thick, and, using a biscuit cutter, cut the dough into various shapes. I rolled the dough into a circle 1/2-inch thick and cut the dough into 8 wedges (For half of the recipe. If you use the whole recipe you would make two circles). Place on parchment-lined baking sheets, brush the tops lightly with egg wash, and bake until golden brown and puffed, 13 to 15 minutes. Let cool on a wire rack. Posted on May 13, 2013 at 7:18 am. It was the best of times. 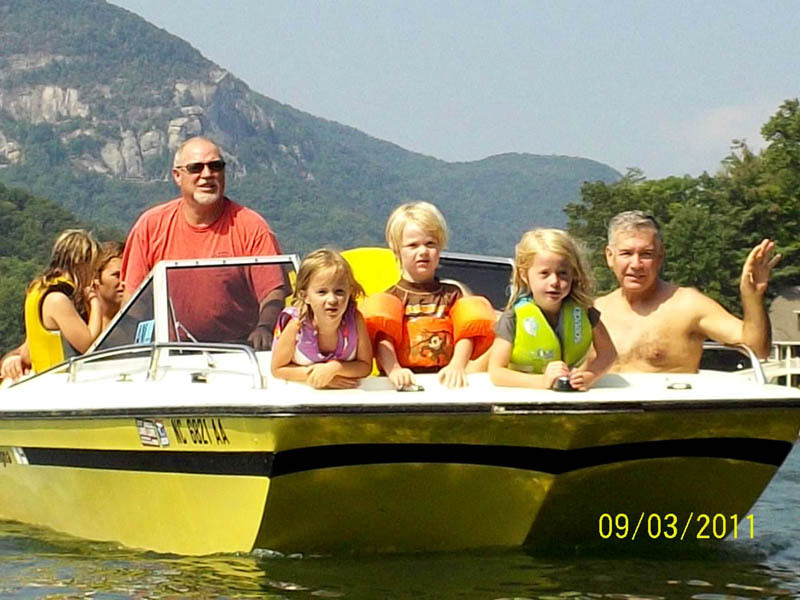 There is nothing like spending a long weekend with the family enjoying the end of summer on the lake. 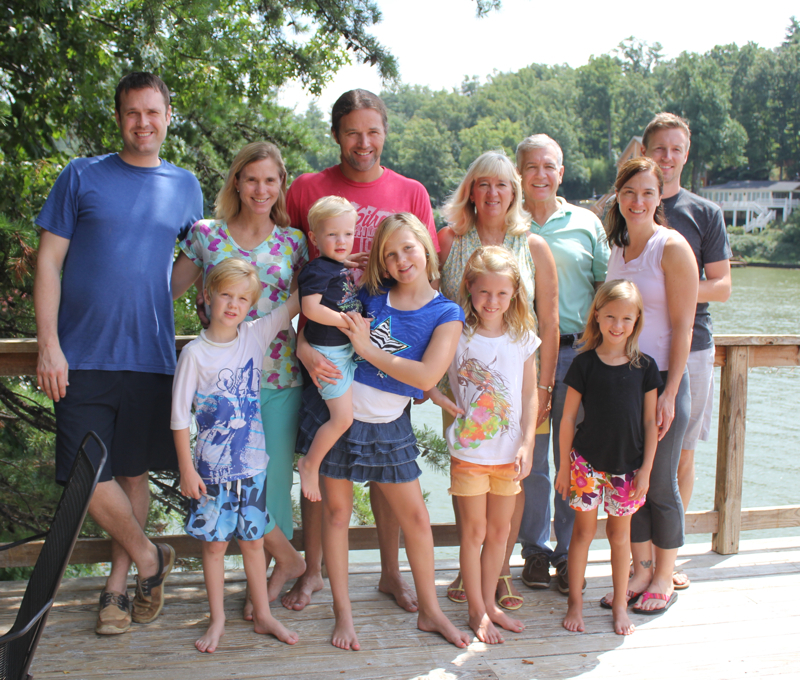 We had cookouts, a birthday to celebrate, a wine tasting and some firsts. Unfortunately I took very few pictures of the food but will share some of the images from the weekend. 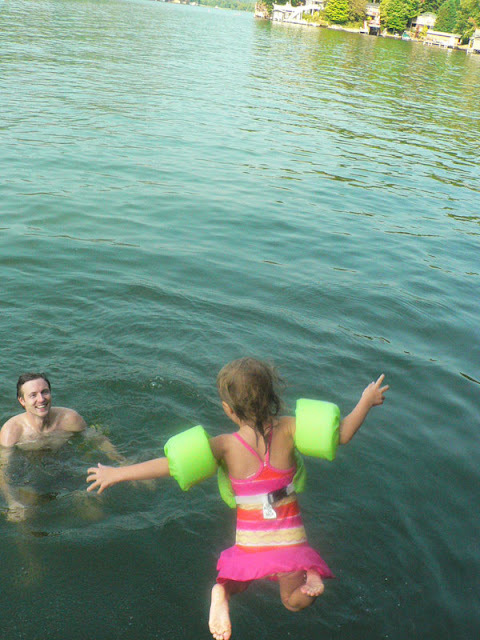 Granddaughter Rachel has been taking swimming lessons and this was the first year that she jumped into the water from the dock. It was Grandson Cameron’s first visit to Lake Lure. 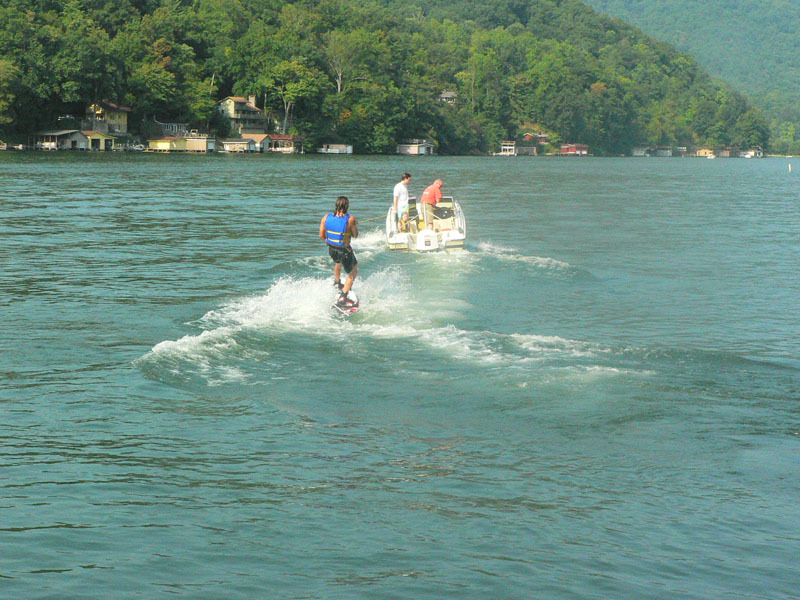 Uncle Jeff got a chance to wakeboard. 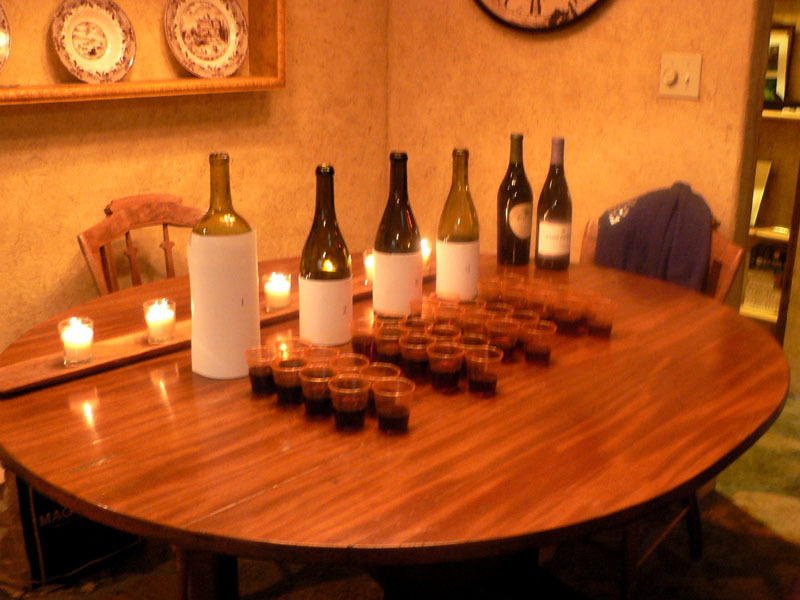 We had a blind wine tasting of Pinot Noir wines from California. The unanimous winner was a Hendry Vineyard Napa Valley Pinot Noir 2008. Thank you Dave A. for always bringing a case of Hendry wines to the holiday get together. 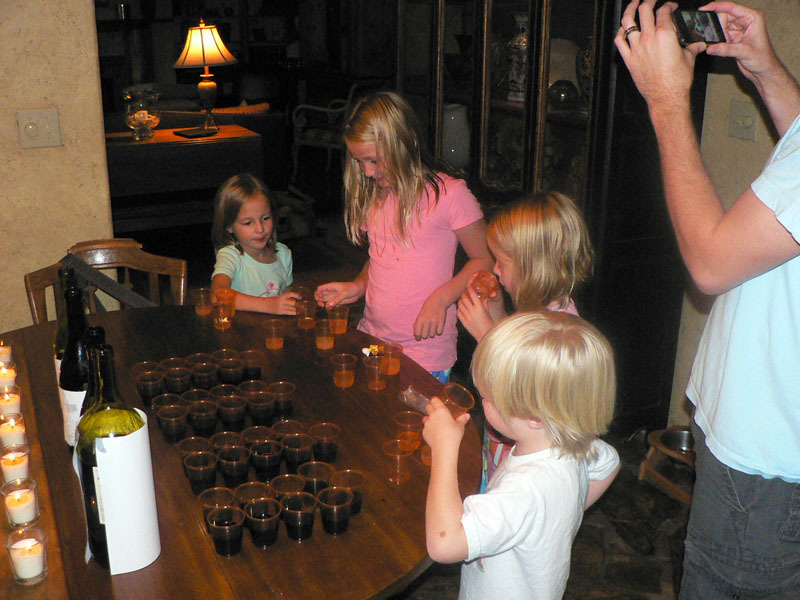 The kids had their own blind fruit juice tasting. The winner was Simply Lemonade. David smoked two pork butts for our pulled pork dinner. It was better than any barbecue restaurant in North Carolina. He made a ketchup based sauce and a vinegar based sauce. 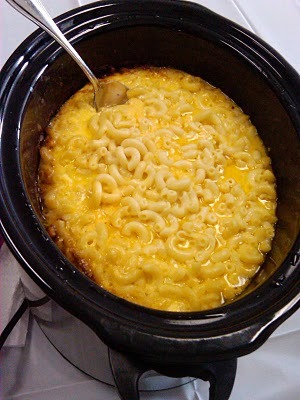 My friend Lyla suggested I try Trisha Yearwood’s recipe for Crockpot Macaroni and Cheese. In the interest of keeping it real here, I have to tell you that this is not my picture. I did not remember to take a picture. The picture came from this site. The adults absolutely loved the mac and cheese and it was easy to put together. The kids liked it, but did not love it. It has something to do with that little box of powdered cheese, if you know what I mean. We also celebrated our DIL Kristen’s birthday. I made a Lemon Layer Cake with Raspberry Curd. 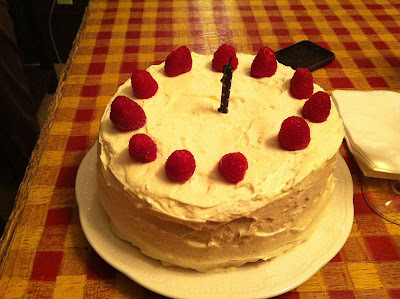 I made the cake layers and the raspberry curd ahead of time and frosted the cake on the day that we served it. 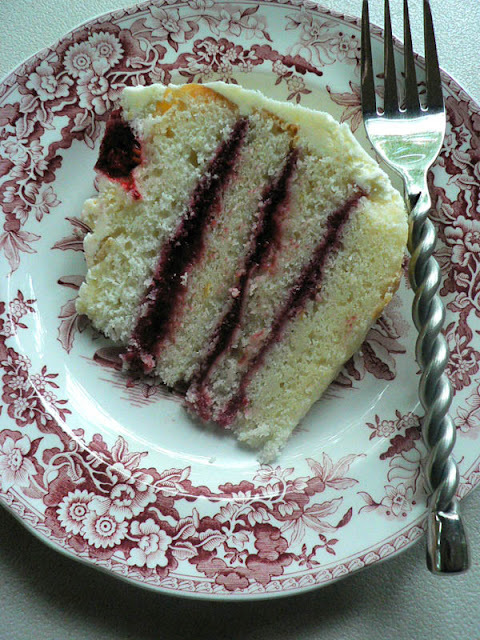 The cake layers are split in half and the raspberry curd is spread between the layers. The raspberry curd filling was delicious. The recipe came from a book called Luscious Berry Desserts by Lori Longbotham. Here it is. Add raspberries, yolks, sugar, and salt. Mash raspberries. Cook 10 minutes, stirring frequently. Pour through a strainer, pressing to extract as much as possible. Cool to room temperature then stir in lemon juice. Chill. Heat oven to 350. Prepare two 8×2 round cake pans. Whisk together flour, baking powder, and salt. Pulse 1/4 cup of the sugar with lemon zest in food processor until finely ground. Beat butter and zest mixture with electric mixer on medium-high speed until fluffy. Add remaining sugar and beat until smooth. Add 1/4 cup milk and beat until just blended. Reduce speed to low and alternately add flour and milk in 3 batches. Beat only until blended, no longer. Beat egg whites in a large bowl until foamy. Add cream of tartar and beat to stiff peaks. Divide batter between the two pans and bake about 35 minutes. Cool 10 minutes in pan then remove and cool completely. Beat butter and zest until fluffy. Add lemon juice and beat for one minute. Cut each cake into two layers. Spread curd in between layers, leaving about a 1/2 inch border. 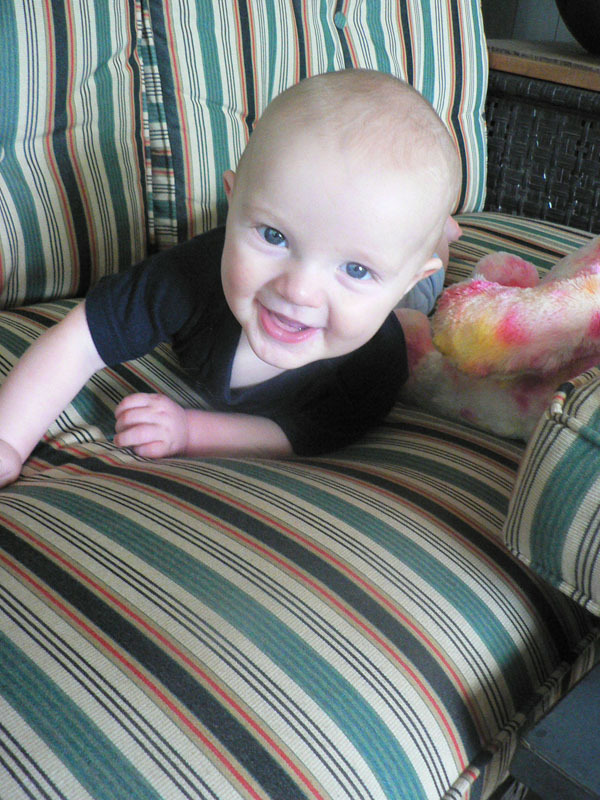 Posted on September 7, 2011 at 10:13 am. OK. There is a story here. My Mother was an artist. She never had any formal training, but her talent was evident from an early age. 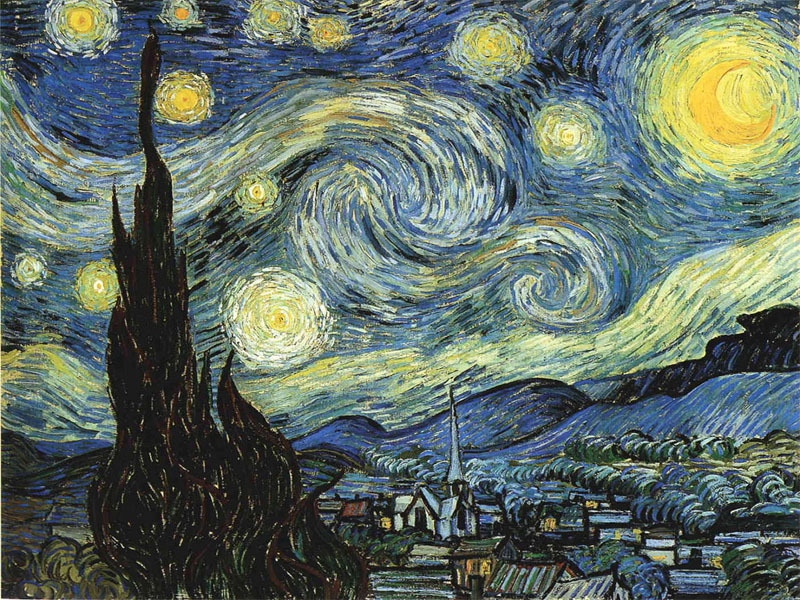 I remember as a child loving the smell of linseed oil and the vibrant paint colors on her palette. 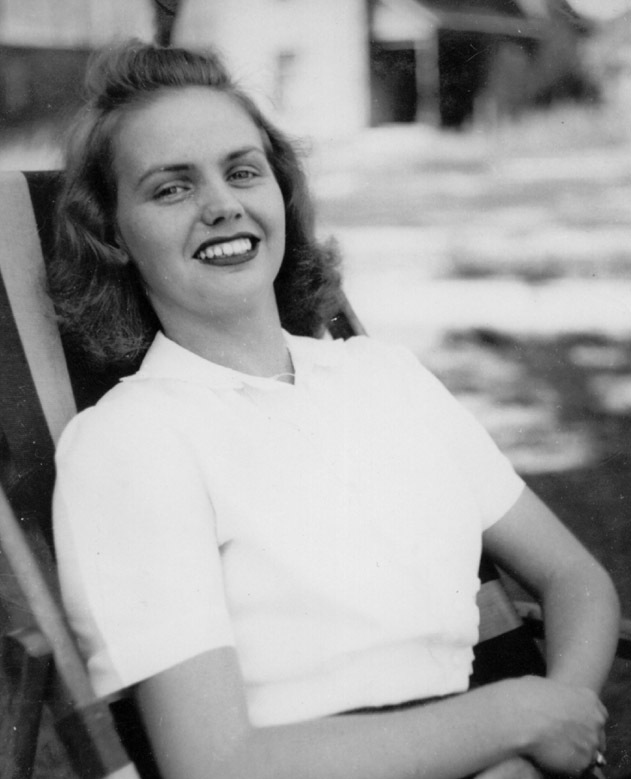 She was a typical housewife of the 50’s, but there was never anything typical about her. She was a joyful person who loved her husband and her two beautiful (excuse the narcissism) children. But there was always her talent that she could not hide even if she wanted to. Her art teacher in high school encouraged her to attend college and hone her exceptional skills. 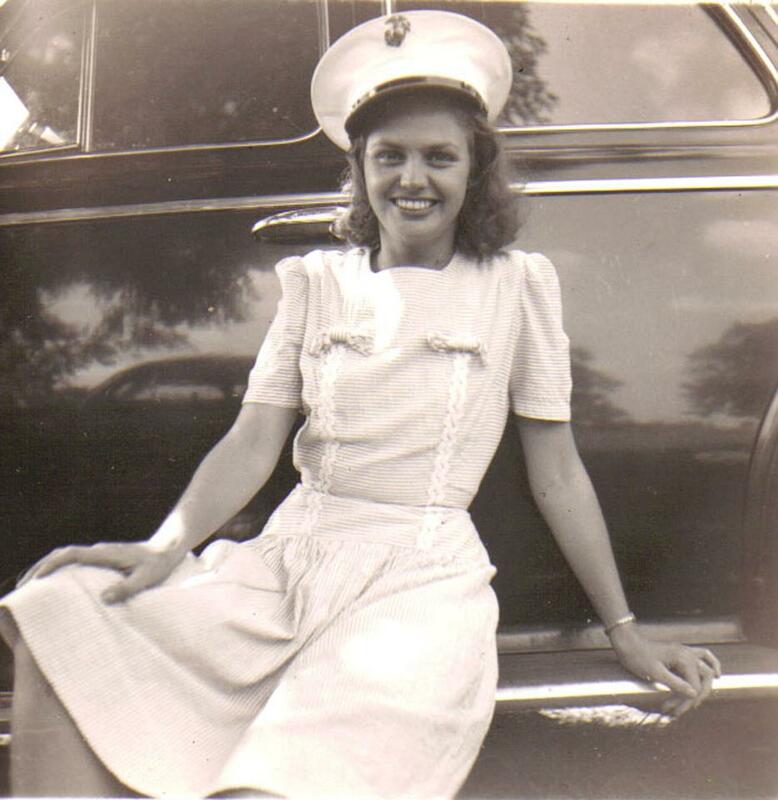 But she had fallen in love with my Father who was a brave Marine during WW II. Their life together was one of the most beautiful love stories that I have ever witnessed. She was happy. But she was also creative. Imagine Van Gogh’s painting of Starry Starry Night. That is what I thought of when I made this cake which is very similar to something my Mother used to make. My Mother embraced all styles of art but her talent was in realism. She painted what she saw and wanted it to look as realistic as possible. I have never seen anyone with a more precise eye to detail than my Mother. Because I have four of her paintings I can marvel at her brushstrokes and the way she made flat canvases come alive with images. Her portraits are amazing. Here are three that are in our living room. 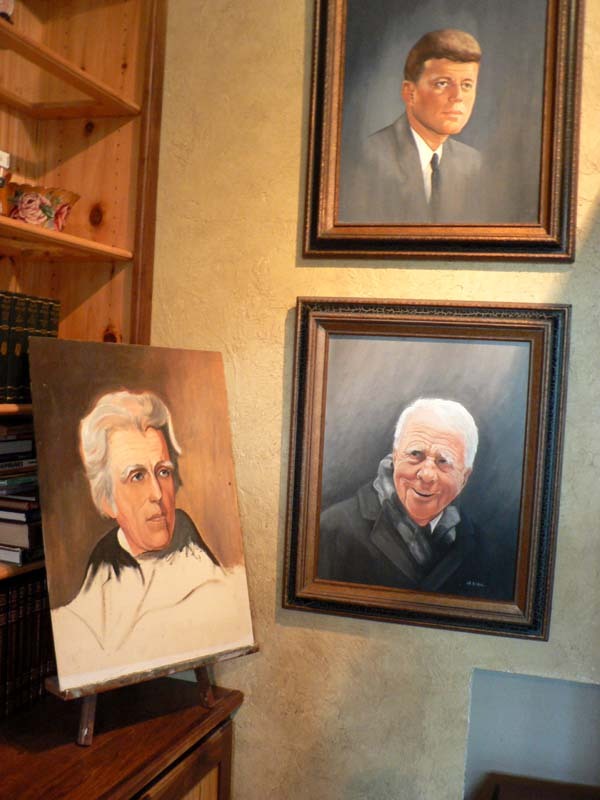 In the case of Andrew Jackson she copied the portrait by Thomas Sully. I always wondered why she had never completed it, but this was the way Sully had left it. It is also the image that is on the twenty dollar bill. Mom was also a talented cook. What I am today I credit to her example. She cooked food, as she painted, with both creativity and love. My SIL Barb recently sent me this recipe for chocolate cake. Barb said “Do you remember your Mom’s Blackbottom Cupcakes? 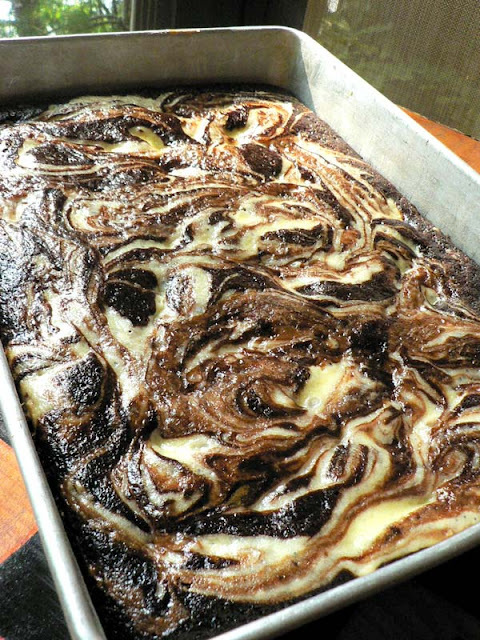 This is a cake recipe that is very similar.” It is a recipe that I’m sure you can find on the internet as a Blackbottom Cake, but I choose to call it Starry Starry Night Cake in honor of my Mom. She would have appreciated it’s beauty and loved it. Sift together flour, sugar, cocoa, soda and salt. Add water, oil, vinegar and vanilla. Pour into 9×13 inch greased and floured pan. 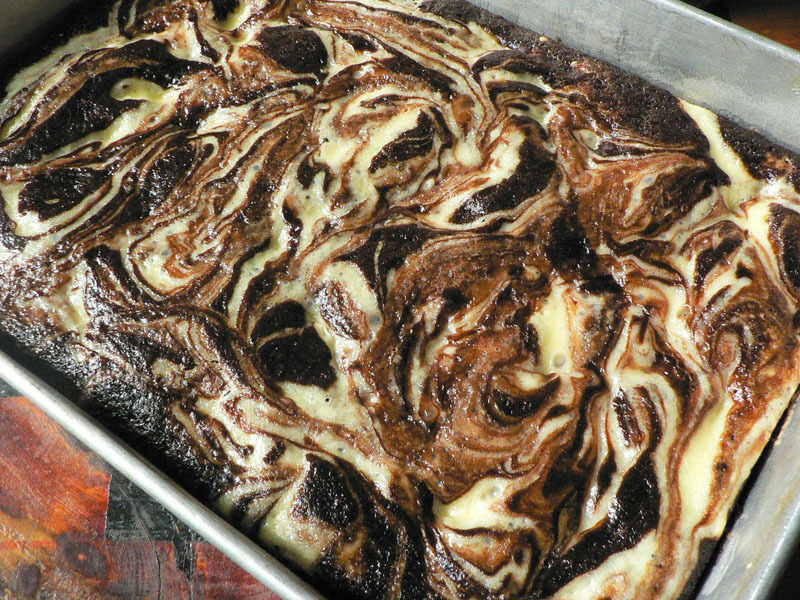 Combine cream cheese, egg, salt, sugar and chocolate chips. Drop by teaspoonfuls onto batter in pan. Swirl knife through batter to create a ribbon effect. Bake 30 minutes at 350 degrees. Sprinkle with chopped walnuts and confectioners’ sugar if desired. Mom would have sprinkled it with plain sugar. I will see you after the holiday weekend. We have lots of family visiting. Have a fun and safe holiday. More recipes are coming from our cookout. Posted on September 2, 2011 at 8:18 am.